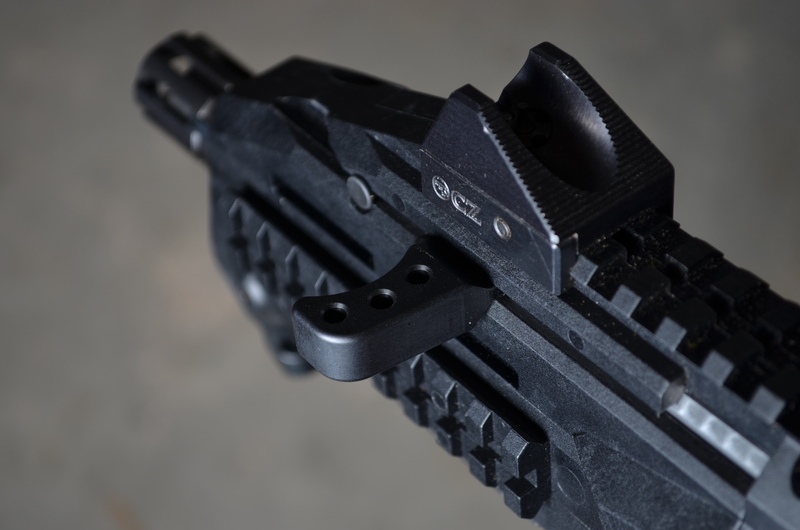 The Theta Extended Charging Handle for the CZ Scorpion EVO 3 gets your fingers away from the molded picatinny rails (knuckle biters) on the barrel shroud of the Scorpion, and provides a larger and more robust control handle for charging the weapon. The Theta Extended Charging Handle is ambidextrous and can be used on either the right or left side of the Scorpion. The finger catch/handle is machined from 6061T6 aluminum then hard coat anodized to MIL-A-8625, and the charging rod is machined from precision ground 17-4 stainless steel and black nitride finished. 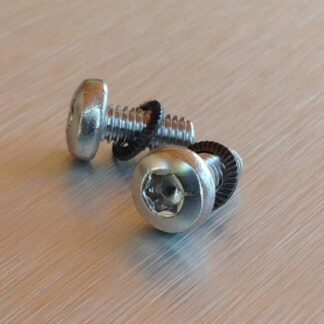 Designed and Manufactured completely in USA. PLEASE NOTE: These charging handles are intended for use with the factory Scorpion Pistol or Carbine handguards (made from polymer). 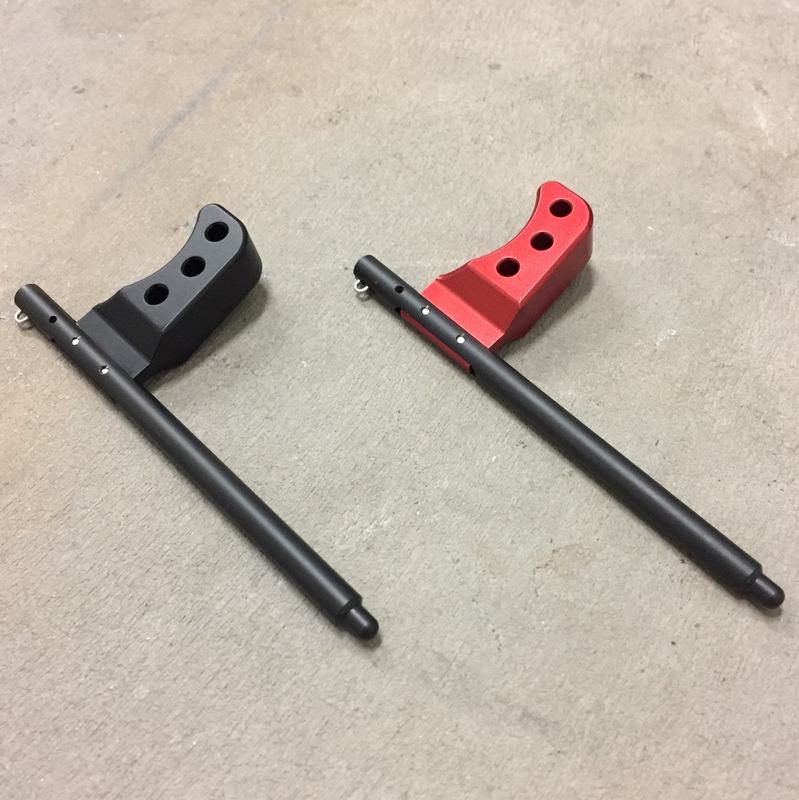 If you have an aftermarket aluminum handguard installed we recommend that you consider our Pro-Stock extended polymer charging handle. 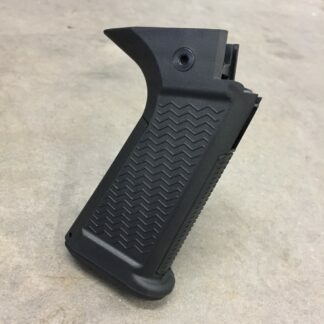 Aluminum charging handles (including our own) can cause increased friction in aftermarket handguards and in some cases may not run as smooth due to the aluminum-to-aluminum interface with aftermarket handguards. If you need any help deciding what setup might work best for your application please just call or email, we are here to help! Gunsmith Installation Recommended for All Parts. Just got in the charging handle. After a quick visit to YouTube I had the info needed to swap out the tiny factory handle with something far easier to use. In less than 2 minutes, the handle was swapped. The HB handle is really nice and the fit and finish is off the charts. 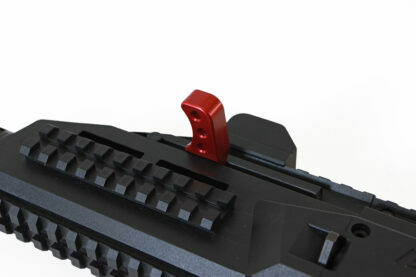 This is a high quality piece that makes a huge difference in the ability to charge the pistol. Where the factory was maybe a finger wide, the HB unit you can get 2 fingers on and keep your knuckles away from the top rail. Ordering was fast, and responses to my emails and questions was prompt. Thank you to Phil & the tem at HB. Great product & customer service. this is the first and most important change you need to make to your EVO, if you don’t want bloody knuckles after a shooting session. The finish and feel of the handle are perfect! can’t wait to put on the trigger! Very nice, a lot more purchase on it. Must have item. As with all of their products (I have the right side safety delete and trigger springs) the fit, finish and function is excellent. This small change makes a huge difference. no more beaten up knuckles. a HUGE improvement over the cz factory part. thanks so much. This extended charging handle is great. 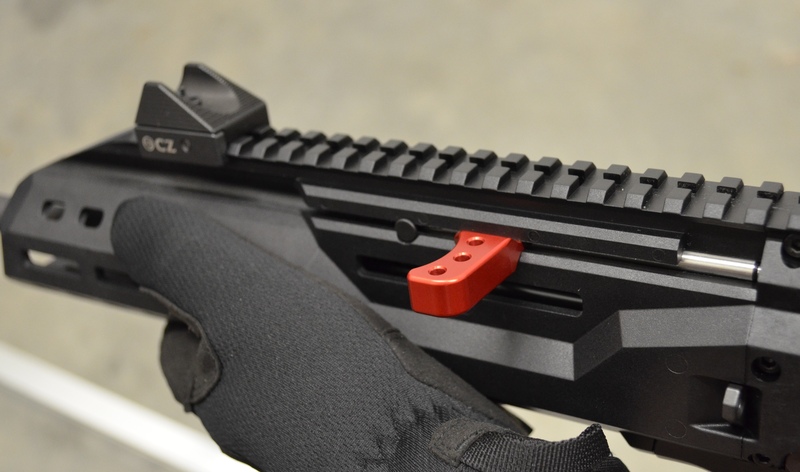 It lets you get two full fingers on it, and keeps you from busting you knuckles on the handguard rails. 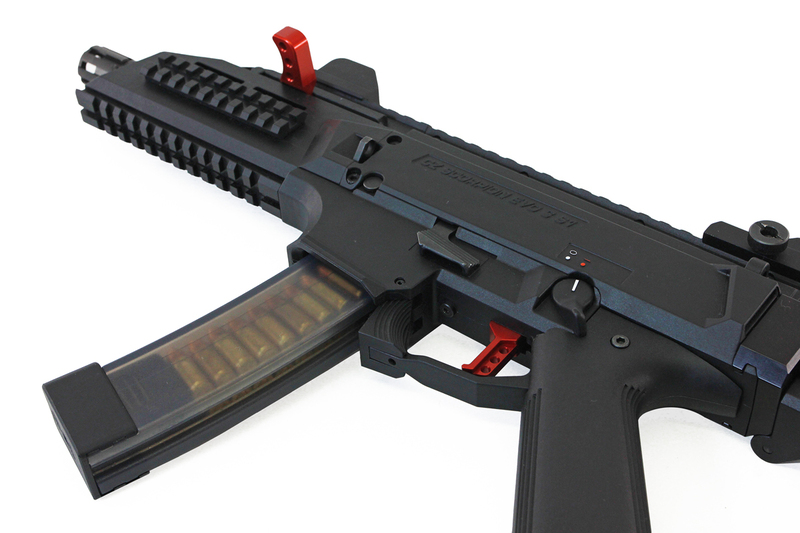 It is a serious improvement to the overall function of the Scorpion, and only takes minuets to replace. It also makes the return slap (HK MP5 style) even more addictive! These guys rock, I got all my parts super fast and they fit great. super nice stuff at an awesome price. 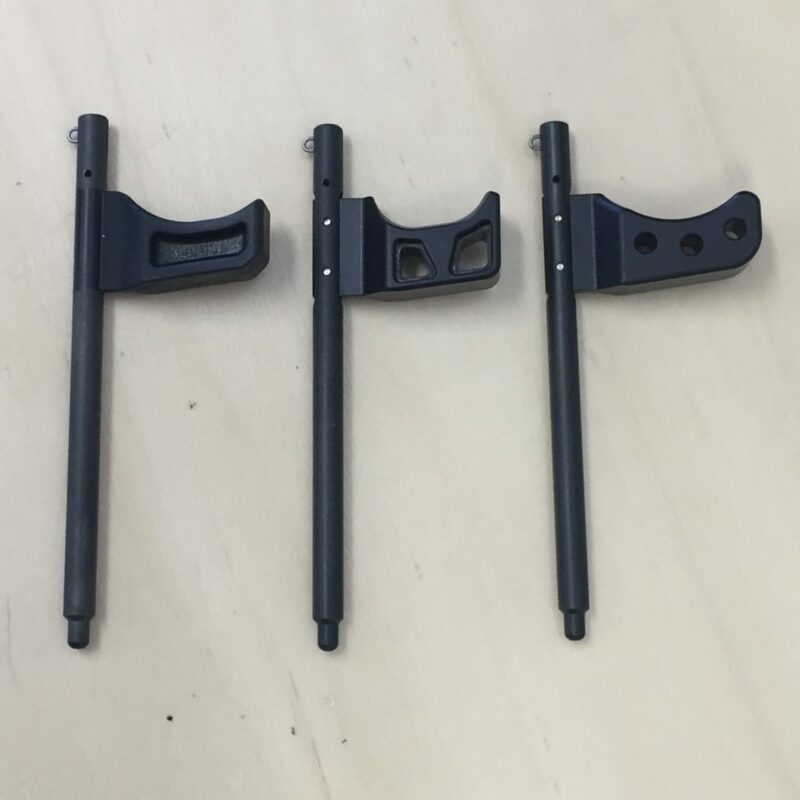 I RECEIVED MY CHARGING HANDLE, RIGHT SIDE SAFETY BAR AND DUCK BILL MAG RELEASE. 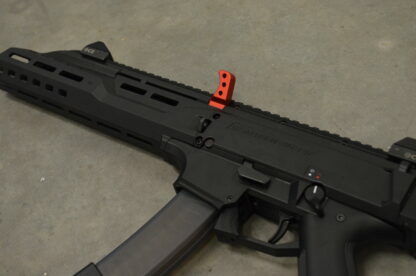 AFTER A PAINSTAKING SEARCH, I WAS ABLE TO FIND THE EVO 3 S1 IN THE CARBINE. THESE NEW UPGRADES FIT PERFECT, ARE OF HIGH QUAILTY AND REALLY MAKE A DIFFERENCE, ESPECIALLY THE CHARGING HANDLE. 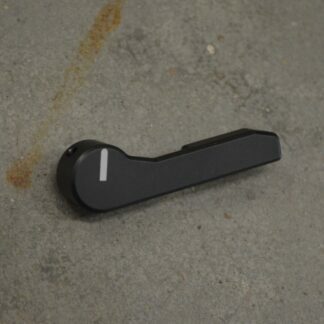 VERY NICE TO CHARGE THE ACTION WITHOUT DAMAGE TO MY FINGER… WOULD GIVE A 10 RATING…. Love this Charging handle it is a little bigger than the other charging handle ,I have both of them they are well made an work well.They help make your gun work great an look better a win win. This is an excellent addition to my Scorpion! I don’t have use of my left hand fingers, so having the longer lever makes use of this gun much much easier. I recommend it to everyone! Another one of those must-have upgrades. 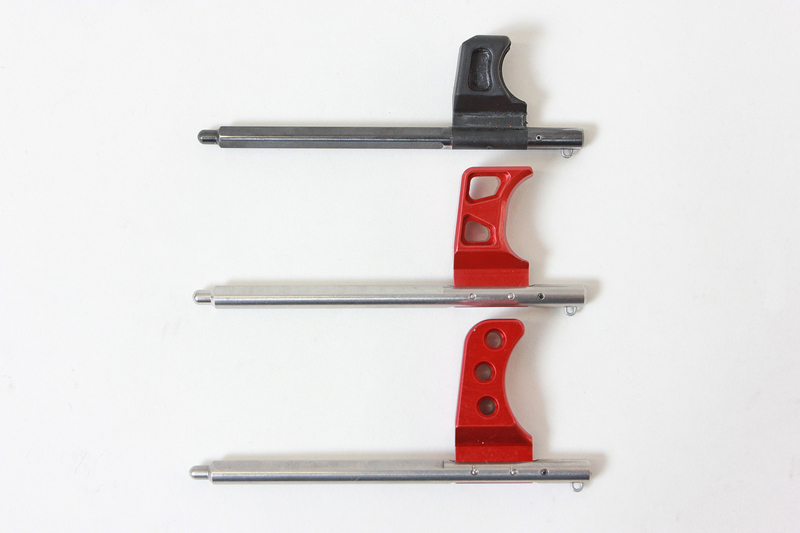 You will see a world of difference when you replace your stock charging/bolt handle with this one. And replacement steps are very easy – anyone can do it. And might as well get the other things too. Here’s how I would rate the upgrades I added. This is one of the three upgrades I made so far. All three are I believe must-have upgrades. 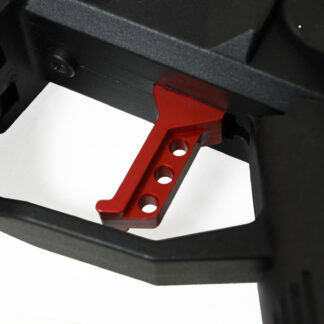 Ease of operation increases dramatically when you replace the stock charging handle, the mag release and the ak style safety. Fit & finish on all three are great. All three were quick and easy to replace – unless you have ten thumbs you can do it. Every HBI upgrade I add to my Scorpion makes an already great shooter that much better. Each item fits like it grew on the Scorpion. I could not be more pleased. 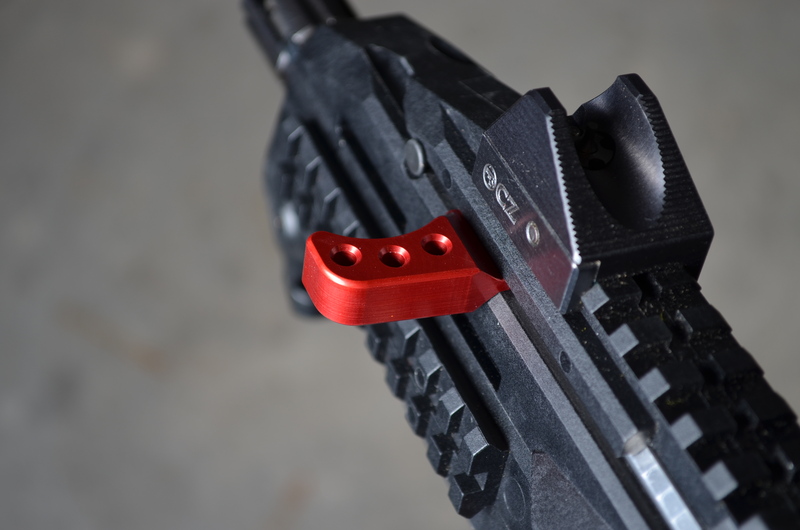 The Red Charging Handle and matching Trigger not only function perfectly but , look Cool too. I also added the right safety delete and trigger spring kit and am waiting for the Duck Bill Magazine release. HBI is such a pleasure to do business with…Keep up the good work ! Randy , Dinwiddie VA.
Another 5 star product. Stock lever works, but is pretty cheap quality and def small. This one you can grab it with authority and fits like a glove in your finger. Installs in less then a minute. Just grab a small punch, pop the pin out, then use the punch to puah in the hole and it will depress the spring in the old changing handle and slide it out, slide new handle in, re-install plastic pin and away you go. I’m so happy I found this company. Extremely nice and functional piece. Much easier to grab and operate. It’s definitely a great buy. purchased the larger charging handle and the large AK style safety . A must have for any scorpion owner . Great service & quick delivery . 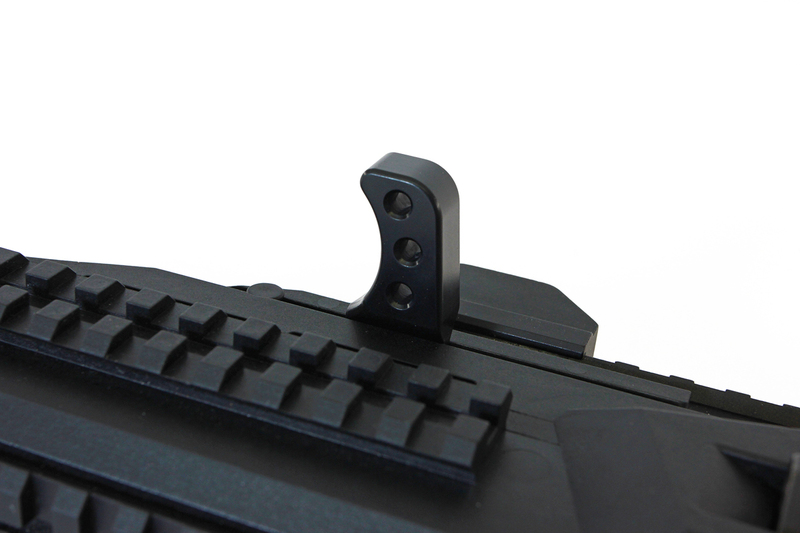 One of the biggest headaches about the scorpion is the minuscule charging handle. 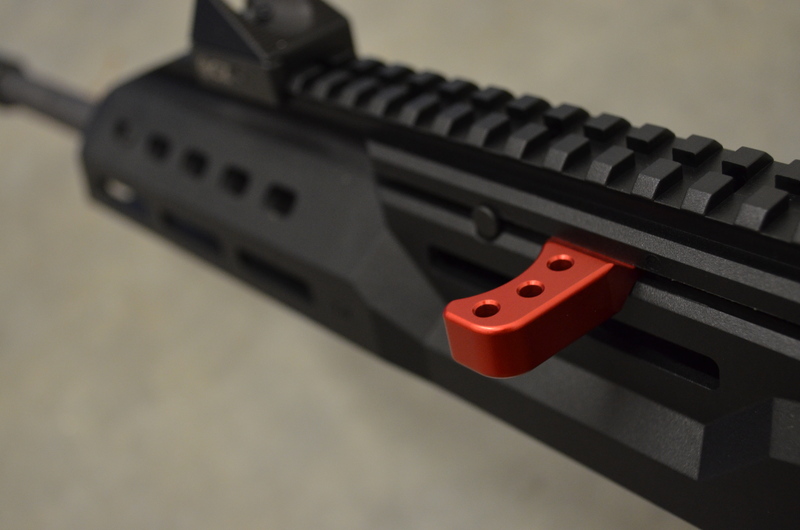 This new charging handle should be one of the first upgrades you do to the firearm. It literally take 2 minutes to do and makes a massive change to the ease of operation. Great product!!! !